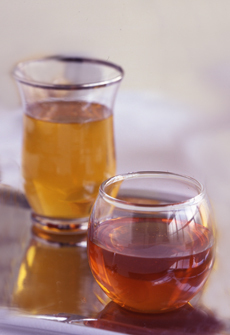 Hot buttered rum, or rum toddy, at left, flanked by a Scotch toddy. Photo courtesy National Honey Board. This is Page 3 of a three-page recipe article. Click on the black links below to visit other pages. A cocktail made with boiling water, sugar and spices is traditionally referred to as a "toddy," and made with whiskey or sherry. Warm alcoholic beverages such as glogg, mulled wine and toddies originated in Northern Europe, where beer, cider, wine and spirits were mulled with sugar and spices to add some cheer to cold winter days. Hot buttered rum is a toddy (specifically, a rum toddy). Toddies can be made of any spirit—bourbon, brandy, tequila, Scotch and other whiskeys are popular. Hot buttered rum was a favorite in Colonial America. Rum is a New World spirit, made of molasses, a by-product of sugar refining. Distilleries in the Colonies were making rum from the molasses by the 1650s, and “hot buttered rum” joined the toddies and nogs of English tradition (a nog is a beverage made of beaten eggs). Hot buttered rum is traditionally made with dark rum, which has been aged in oak barrels to develop a deeper, molasses flavor. You can use light rum or spiced rum for a milder or spicier flavor, respectively. Dark rums can also be drunk straight. You may see photos of, or recipes for, creamy toddies, which add cream or ice cream to the basic recipe. These are new interpretations, not traditional toddies, which were not cream beverages. or other mug. Cream together (muddle). Add rum (three ounces for a stronger drink). Add an equal amount of boiling water. Stir well. Garnish as desired. Serve immediately. If the drink is too strong for your liking, add more boiling water. Mix 1 stick unsalted butter, 1 cup light brown sugar (you can add more—up to 2 cups—for a sweeter drink), 1 teaspoon cinnamon, 1/2 teaspoon nutmeg and a pinch of ground cloves. Cream ingredients in a bowl and refrigerate, covered. Per cup, add 2 tablespoons of the mixture into the Irish coffee glass or mug, then top with 2-3 ounces of rum and an equal amount of boiling water. Stir well, garnish as desired.